SOLD $130,900! 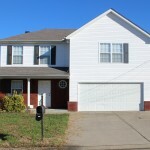 | Middle Tennessee Real Estate :: Maples Realty & Auction Co.
Saturday, December 19th @ 1:00 p.m. Directions: From Murfreesboro Rd / Hwy 41 turn right on Stones River Rd., right on LaVergne Lane, right on Holland Ridge, left Tonya Dr., right on Quiet Ln., home on the left.